1.e4 Nf6 2.e5 Nd5 3.d4 e6 4.Nf3 g6?! 5.c4 Bb4+?? Kaspaov played 6.Bd2 and won in 22 moves, however he missed the best move and my pattern recognition immediately went to work when I looked at this game. I had seen this before!! 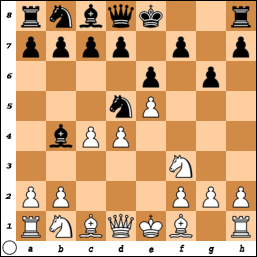 The move here is indeed 6.Ke2!! and white wins a piece since after the knight retreats we play c5 and then trap the bishop with our pawns, be sure to check the Tim Krabbé piece, this is called the earliest king move to cause resignation!